The 2016 edition of the Poor People's Energy Outlook (PPEO) explores energy access planning from the perspectives of poor people. 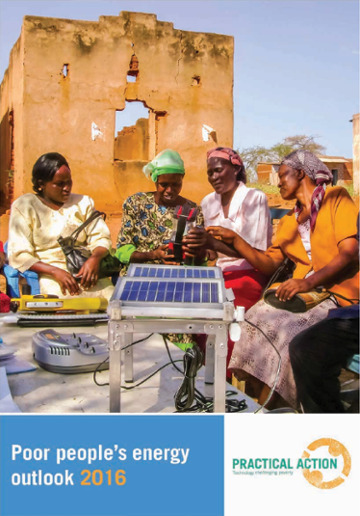 It uses case study evidence from three contrasting countries to unpick what it means to plan for energy access from the bottom up, basing those plans on the energy needs and priorities expressed by the energy-poor. Despite increased attention on energy access in the last five years, much national energy planning, whether through SEforAll or nationally driven policy processes, is still dominated by large-scale, top-down, centralised energy infrastructure development. Even where there is an intention to deliver off-grid energy access at scale, uncertainty about what options will be the most appropriate still prevails. 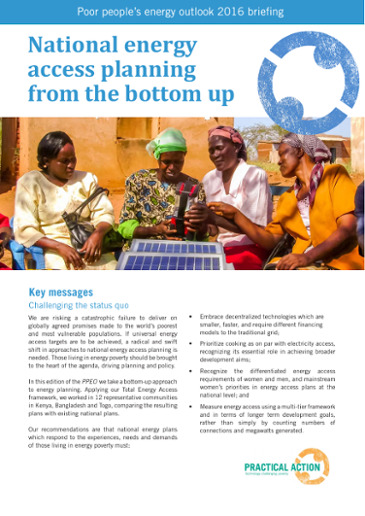 This edition of the PPEO highlights the practical, decentralised energy solutions that will meet poor people’s prioritised needs; and helps inform discussions about the appropriate minimum levels of energy access policy-makers should be aiming for, both nationally and within the sustainable development goals. Current approaches to addressing energy poverty, and planning for energy access, are wholly inadequate. In fact, if we continue along this trajectory, energy poverty around the world is set to increase, not decrease, as we move towards 2030 (IEA 2014; IEG 2015). 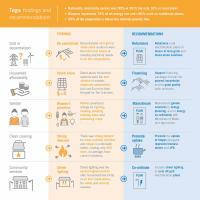 Measuring energy access holistically in terms of longer-term development goals: such as numbers of jobs created, agricultural productivity increased and children educated - rather than simply by counting numbers of connections and megawatts generated. We presented the PPEO findings in a webinar hosted by the Clean Energy Solutions Center, with panellists from the Global Alliance for Clean Cookstoves (GACC), ECOWAS, and WWF Africa. 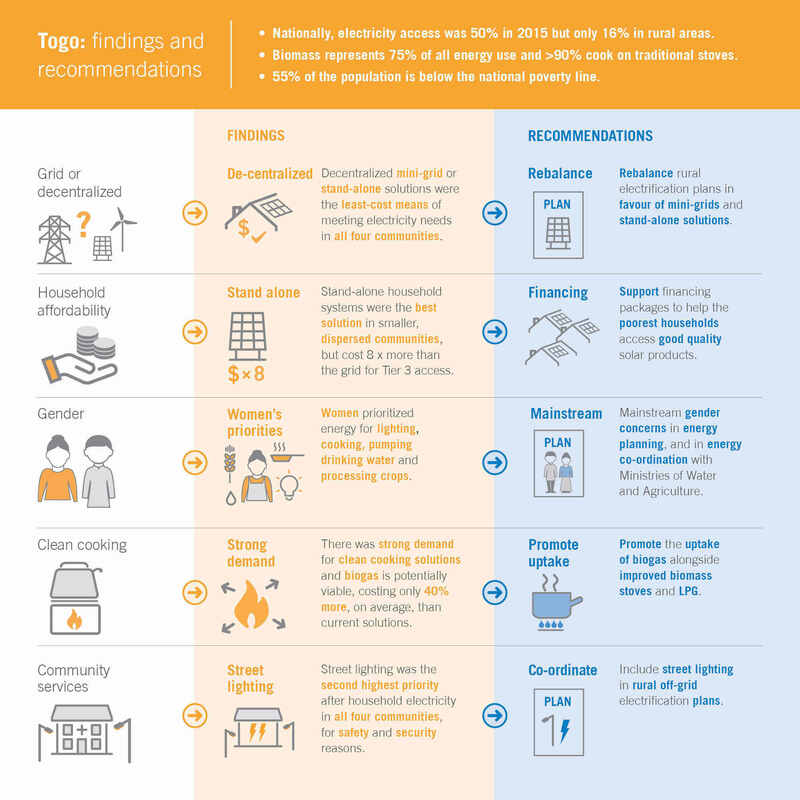 Developed collaboratively between the EU Energy Initiative Partnership Development Facility (EUEI-PDF), Energising Development (EnDev) and Practical Action, the National Approaches to Electrification tool helps to realise many of the recommendations from the PPEO 2016 - including the necessity of a range of electrification approaches to achieve universal energy access. It is an easy-to-use electronic guide which provides a comprehensive overview of electrification solutions; allowing them to be compared and contrasted, and using case studies from around the world to illustrate the options. The tool will enable policy makers and programme designers to decide on the best national electrification strategy for their country context. Rock-processing. Sardar Para in Panchagarh District, at the northernmost tip of Bangladesh, has 1,748 households in the village and surrounding area. The main source of income is rock collection and processing for the construction industry. Tea cultivation also began in the district (although not in this village) in the last few years. High rainfall, seasonal flooding. Agriculture. Alamkhali in Sunamganj District has a tropical climate, receives significant rainfall across the year, and is subject to seasonal flooding. The village and surrounding area has 693 households. The area is known for its haors: large, shallow lakes which accumulate water during the rainy months. Some places, including many roads, can remain under water for half the year. Alamkhali is 7 km from the nearest grid. Coastal, cyclone affected. Fishing. Tengagri Chak in Barguna District is a coastal village spread along a narrow strip between the coast and the jungle, 10 km in length and containing 1,085 households. The main livelihoods include fishing, fish processing, and agriculture. The region is prone to cyclones, and super-cyclone Sidr caused a great deal of economic damage in 2007. Grid electricity has reached the west side of this area. Agriculture. Tribal communities. Thanchi, in Bandarban District, is in the Chittagong hill tracts region. The area includes the sub-district market centre of Thanchi Bazaar (population around 500) and an area of hilly, semi-wild land extending to 10 km from the centre, and containing approximately 20 dispersed villages and hamlets. There is a distinct difference between the more mixed population of the main village and the almost exclusively tribal communities beyond, who have their own language and culture. The whole area has 934 households. Agriculture is the main livelihood: forest is cleared to grow crops on a shifting basis. Men are also involved in transporting wood and bamboo via the Sanghu river while some women weave cloth for family use or sale.This is the poorest of the four settlements. The construction of the Thanchi Bridge across the river in 2012 has brought development. Construction work started in 2015 to bring the grid (55 km away) to Thanchi Bazaar, the last sub-district centre to be reached. Arid and semi-arid lands. Fishing. On the western shore of Lake Turkana, Kalokol (Turkana County) is in Kenya’s arid and semi-arid lands. There are 890 households across Kalokol town and two nearby settlements: Namukuse and Kalimapus. The livelihoods of most of the population depend on fishing or cattle-herding. The district’s population density is low, and the nearest grid electricity is 55 km away. Mkwiro, Wasini Island. Fishing. With 230 households, Mkwiro village, Kwale County, is on the small island of Wasini in the Indian Ocean, south of Mombasa.The main livelihood activity is fishing, but stocks are reducing. People also sell seashells, weeds, and rare sea animals. Some act as tour guides for very occasional tourists. Poverty levels are highest in this community. Western Kenya. Smallholder farming. Sibinga, a village of 754 households grouped into about 300 homesteads in Busia County, is close to Lake Victoria and the Ugandan border, on a low hill surrounded by swampy land. Most people are smallholder farmers growing cassava and maize and keeping a few cows. Although not currently grid-connected, community facilities (at least) may be connected in the next three years. Average incomes are higher here than the other settlements. National energy access planning in the overwhelming majority of the world continues to be undertaken far from those experiencing the realities of energy poverty; 85% of whom live in isolated rural areas, far from the centralised grid and political influence of the capital. Previous editions of the PPEO have shown how the needs of people living in energy poverty are quite different from what conventional energy systems are set up to deliver. In this edition, we therefore wanted to shine a light on the energy service priorities that people need, want, and have a right to when given the choice; and how differently energy access plans might look when based on meaningful consultation with the energy-poor. Having developed the framework of Total Energy Access in previous editions, we need to move to operationalisation. In the next three in the series, we will address different aspects of how a people-centred, total energy access approach can be implemented in terms of planning, financing and delivering at scale. Since the conception of SEforAll, and the ratification of the Sustainable Development Goals in September 2015, (which saw energy access enshrined in its own SDG), energy access has been firmly on the development agenda. It is widely understood that energy is not just a goal in and of itself; it is an enabler of wider development, including poverty reduction, gender equality, improved healthcare and quality education. 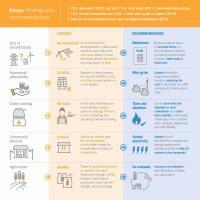 This edition of the PPEO is therefore timely, as it is the first global attempt to redefine how energy planners should approach SDG7 and ‘do energy planning differently’, in order to stand the best chance of achieving universal energy access, and many other global goals, by the 2030 timeline. Prioritizing cooking is essential to achieving broader development aims. Practical Action firmly believes that access to modern cooking services should be considered as on par with electricity access; and yet, it continues to be overshadowed in many national plans and often overlooked in global advocacy efforts. This is despite the fact that cooking with dirty biomass kills millions of people annually, mostly women and children, and collecting and processing it drains millions of hours per year. Cleaning up cooking will free up time, massively reduce women’s burdens, save billions of dollars in health care and millions of hectares of forests, while costing dramatically less than universalizing electricity.Our findings showed that a Tier 2 biomass cooking solution for all in our case study communities would cost 7% of the cost of Tier 3 electricity access for all in Kenya, and 22% in Bangladesh. However, switching to a Tier 4 solution (LPG) would be more expensive than electricity access in Kenya, and only marginally cheaper than electricity access in Bangladesh. Energy access planning needs to mainstream gender concerns and be used as a tool to empower women. Women’s energy access needs and priorities differ from men’s, reflecting their different gendered responsibilities and the extent to which their lives are made more challenging and less productive as a result of a lack of energy access. For instance, in our case studies women often prioritized lighting at home for security over street lighting and, beyond the domestic sphere, they have particular energy needs for agricultural processing and accessing clean water. It is energy services that matter most to poor people, not energy supplies. People care about lighting their homes, powering their schools and health clinics, and running successful businesses; many of which are actually best-served by decentralized solutions. 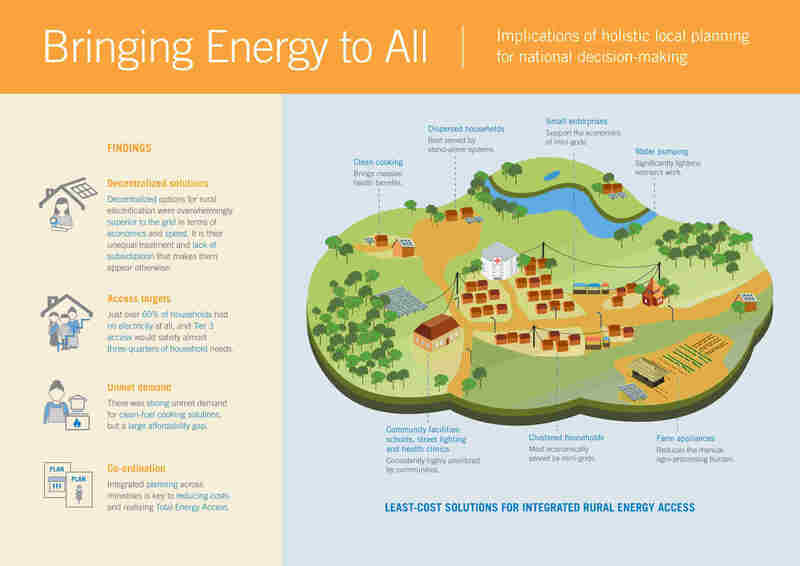 Putting energy-poor people at the heart of rural energy planning therefore fundamentally changes the balance of national energy plans in terms of technologies (smaller), timelines (faster), and economics (different financial support, more rural economic opportunity, more energy-sector jobs). Our findings showed that in eleven out of twelve communities, decentralized solutions (mini-grids or stand-alone solutions) were found to be cost-competitive or cheaper than grid extension. Decentralised solutions offer people choice. 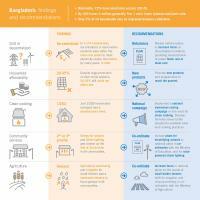 When governments approach energy access with a ‘grid or nothing’ mentality, they not only remove the decentralised services that are most likely to deliver sufficient levels of energy access to these communities, they also take away people’s power over their decisions as consumers and the wider development benefits that alternative technologies would result in. For instance, bypassing solar home systems and solar panels in favour of a grid connection that will likely take years to arrive is effectively making people wait for something they can inherently afford, and are willing to pay for. Decentralised solutions are not only powerful, but empowering. In the communities we studied, in particular in Bangladesh and Kenya, there was impressive penetration of solar lanterns and solar home systems. 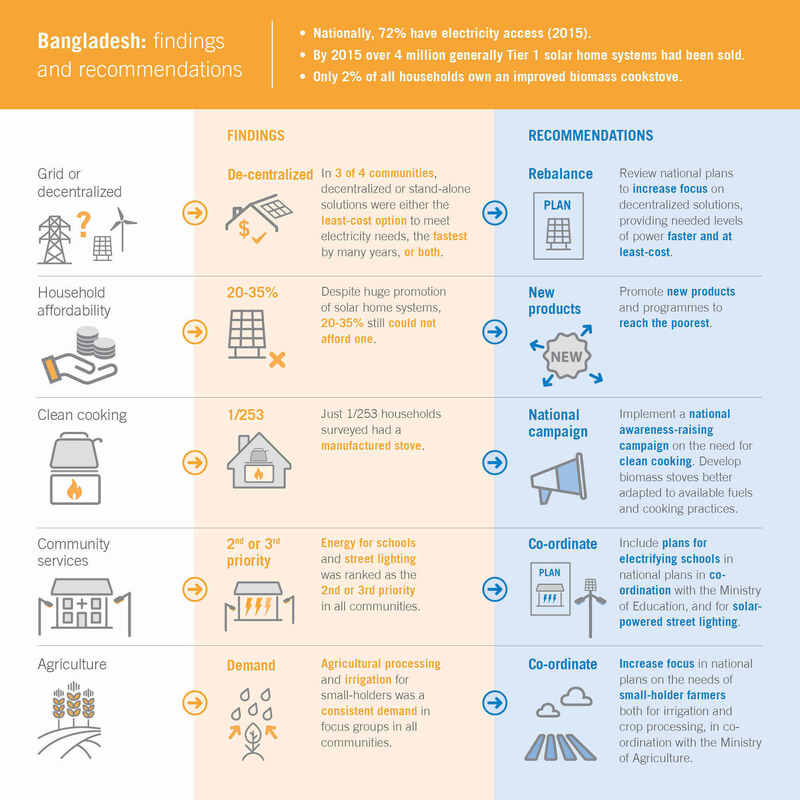 In Bangladesh, over two-thirds of households had a solar home system in three of the four communities. In Kenya, over 60% of households had a solar lantern or home system in two of the four communities. 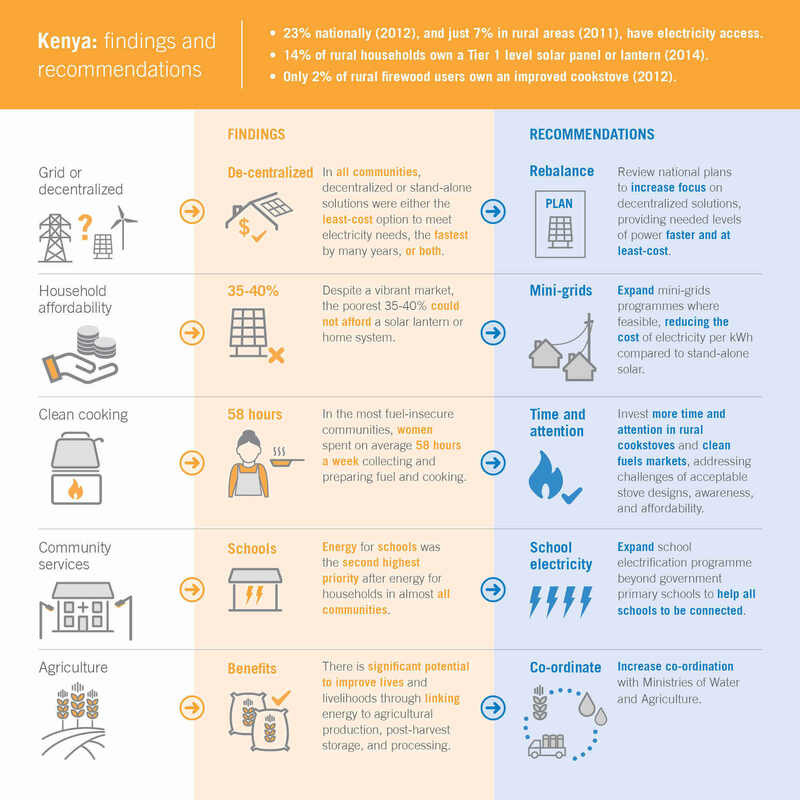 This compares to grid connection rates of just 7% in Kenya’s rural areas, and 43% in Bangladesh. Penetration of solar markets in Togo was far less. These systems were highly valued by households who owned them, and large numbers of households said they would like to own solar lanterns as well as being connected to a grid / distribution system in the future. However, it must be acknowledged that the performance of these systems was almost universally limited to Tier 1. The quality and duration of electricity supply they achieved meant that high proportions continued to use other sources of energy for lighting alongside their solar products. Our recommendations are therefore that national planners need to find ways to encourage solar products to be available in communities they have not yet reached, and affordable for poorer households who cannot currently afford them. National plans will need to promote a mix of options including some communities where stand-alone solar will be the main solution, and others where they will be a key part of the solution. While, based on the rigorous research we undertook in Bangladesh, Kenya and Togo, we suggest these tier targets for households and SMEs, we firmly believe that the international community should measure access and track progress across all the tiers as well as setting a benchmark for what does and does not count as access. We think this will ensure an adequate level of ambition, as well as valuing progress at lower tier levels - which should not be underestimated in terms of their positive development impacts. National plans should set targets across the tier levels (as they have done for electricity access in Kenya). We also recognise that increasingly efficient appliances have the potential to reduce the amount of energy required for a particular service and so, in time, tier targets may evolve in accordance with market development, appliance efficiency, and other contextual factors.